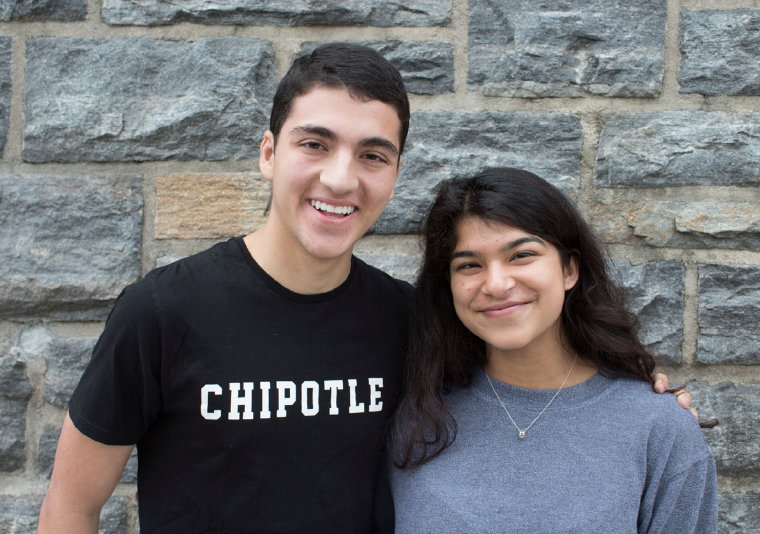 This year’s Student Body President (SBP)Daniel Posner (12) and the Community Council (CC) have taken on initiatives to improve the quality of student life and involvement. 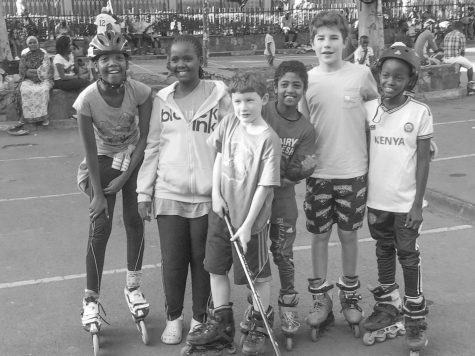 “At the core of the SBP role is the goal of creating and enhancing community. This is a mission that extends across student government and it is why student leadership brings so much value to the school,” Posner said. Student government achieved several important goals, according to Posner. “From assemblies that showcase student talent to the speaker series that brings new voices to campus to fun and celebratory events, I am very proud of all that the HM community accomplished,” Posner said. ONE LAST TIME Senior members of the Community Council celebrate their work. One of the highlights this year was when the school community stepped up in response to the natural disasters in Texas, Puerto Rico, and Mexico, Posner said. “In addition to donating food and clothing, we came together to discuss the environmental challenges we face and how we as a school community can be better stewards of the environment,” he said. Through the work of CC representatives, positive changes have been made to the school community. “One of my goals going into this year was to change the perception of student government because many people don’t think it is legitimate,” CC Chair Amir Moazami (12) said. “Most of that is on the CC, but part of that is on the administration for giving the CC less power than they had in the past.” He hopes that in the future, the CC will have a say in larger administrative decisions. Another one of Moazami’s goals was to, “get students to be more socially conscious and thinking about issues of equity and justice,” he said. A way that the CC addressed this goal was through the Rohingya Drive, which raised money for genocide victims in Myanmar, Moazami said. This year, Moazami and the CC Secretary, Janvi Kukreja (11), re-implemented a committee system, CC representative William Golub (11) said. Moazami chose a committee system, with the hope that committees would give the CC “more structure,” Moazami said. The three CC committees this year were Student Activities led by Govind Menon (12), Sustainability led by Gustie Owens (12), and Diversity led by Kyra Hill (12), Moazami said. “The goal of committees was to divide work and to allow students to know who to approach if they had certain issues, whereas before everything would go to the CC Chair or Secretary,” Menon said. “Anyone in the CC could conduct an initiative and the head of the committee helped guide the CC members through the process,” Kukreja said. “Having people assigned to these committees helped to streamline the process,” she said. The Student Activities Committee held various school-wide events throughout the year, such as Project X, March Madness, and a baking competition, Golub said. “We were really trying to ignite the school with types of competition that involve collaboration,” he said. Kukreja was proudest of the CC’s work on these grade-wide and school-wide events and initiatives, such as the several forums held and Project X, she said. Some students voiced appreciation of these events and initiatives. “Student government has made visible changes to help improve student life at the school,” Emily Zeppieri (11) said. “In particular, I’ve enjoyed their food initiatives such as bringing the Mister Softee truck on campus,” she said. Two accomplishments of the Sustainability Committee were providing cup sleeves in the cafeteria and a recycling bin for batteries, Moazami said. The diversity committee worked on leading productive conversations, in addition to showing videos in school-wide assemblies such as the whiteboard video and the LGBTQ+ pride month video, Golub said. “Everything done in the realm of diversity has been underclassmen led, which is different from years past,” Menon said. The CC still has work to do in publicizing their efforts, as some students remain unaware of their accomplishments. “It’s unfortunate that I don’t know what initiatives student government is involved in because they have the potential to really change the school,” Shant Amerkanian (11) said. Next year, the Community Council (CC) and Student Body Presidents (SBPs) plan on implementing initiatives designed to help students acclimate to the semester system and the opening of the new building in addition to improving student mental health. The newly elected CC Chair for the 2018-2019 school year is Jeren Wei (11), and the CC secretary is Julia Robbins (10). The new SBPs will be Janvi Kukreja (11) and Nader Granmayeh (11). To prepare for the upcoming school year, “Jeren and I will be collecting proposals for initiatives from members of the CC in order to start working and thinking about ideas over the summer. This will be one of our earliest ways to ensure that the CC is very productive next year,” Robbins said. Kukreja and Granmayen plan to address the initiatives included in their platform such as stress relief, increasing school spirit, and improving day-to-day student life, Granmayeh (11) said. They will also concentrate on tackling more complex issues such as mental health and giving back to the community, he said. One of the major changes that Wei plans to implement next year is creating a new idea proposal system for CC members with an increased emphasis on accountability and transparency. In order to incentivize students to complete initiatives, he wants to create a proposal system in which students are required to create deadlines for completing each phase of their initiative and provide the names of the faculty members whom they plan to work with, he said. Janvi Kukreja (right) and Nader Granmayeh (left), next year's SBPs, prepare for a great year. The CC will focus on improving efficiency, ethnicity, and involvement, CC member and co-President of the Class of 2020 Roey Nornberg (10) said. “We plan on making the CC more involved in student life and implementing more activities that can benefit student wellness and lower stress,” Nornberg said. “We are also going to have to try some initiatives to introduce students to the new building and make them feel comfortable in it,” he said. The newly elected CC representatives all have new ideas for improving the school, CC representative William Golub (11) said. Infrastructure-related initiatives such as installing solar panels or switching to soda fountains will take the longest to complete since they require working with several departments of the school, he said. As the school undergoes major changes, including switching to the semester system and using the new building, Kukreja and Granmayeh plan to focus on increasing communication between students and the administration in order to ensure that everyone’s voices are heard, Kukreja said. “In past years, no one has had the opportunity to deal with these two big transitions that we are dealing with, and I think this is the perfect time and the perfect opportunity to get student influence and make real, positive change that can then impact people’s lives,” Granmayeh said. Improving student mental health, however, is a more complicated initiative, Granmayeh said. “Mental health is a more nebulous, less concrete issue that we want to address. We plan to concentrate on general means of decreasing stress systematically in addition to addressing mental health as a larger issue,” he said. “Raising awareness for mental health and our surroundings may require more effort because there isn’t one specific initiative that would solve the issues at hand, it is a combination of many,” Kukreja said. The Student Body Presidents have already begun to meet with various members of the administration and faculty to discuss the logistics of the changes they plan to make in the fall, and will return to campus prior to the start of the school year to tour the new building and meet with Dr. Levenstein, Granmayeh said.